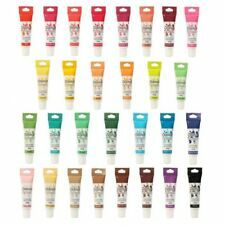 Sugarflair NEW Pastel Concentrated Food Colouring Paste Gel Colours - 25g pot! Food Colouring, EDIBLE COLOUR Liquid Tint, 10ml Droplet Bottle, Cake Decorating. Color icing using Bright Gel Food Color. Kit includes: magenta, orange, teal and purple. These food gels are concentrated. Simply add small amounts of color until you reach your desired shade. Net weight: 1.2 oz (35 ml). Wilton White-White Icing Color is a liquid that when added to royal icing or buttercream will whiten the colour - it whitens and lightens without affecting the taste or consistency of your icing. We reserve the right to refuse service to anyone. 0.4 Grams of concentrate paint. take a small amount of the paint on the tip of a knife and then mix it with a half teaspoon of water. Lot of 6 colors. start by adding a small amount of the already mixed paint to the filling. Metallic Pink Metallic sugar paste colour for cake decoration. It can be used with icing & brushing Edible Metallic Paints are suitable for painting sugar decorations, chocolate, marzipan, etc. Use various brushes to get different results from covering a cake with a thin colour layer to paint creatively with your imagination . Sugarflair Food Colouring Powder Blossom, Lustre or Craft Tints - ANY 3! Sugarflair Food Colour Dust. Choose any 3 from 42 edible 'Blossom' colours. You may also mix-and-match with our 28 edible 'Lustre' dusts or our 10 non-toxic 'Craft' dusts. BLOSSOM TINTS (EDIBLE). CRAFT DUSTING TINTS (NON EDIBLE). Metallic Blue Metallic sugar paste colour for cake decoration. It can be used with icing & brushing Edible Metallic Paints are suitable for painting sugar decorations, chocolate, marzipan, etc. Use various brushes to get different results from covering a cake with a thin colour layer to paint creatively with your imagination . 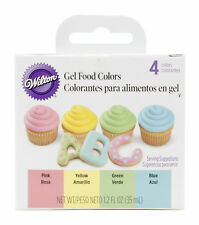 This set of Wilton gel food colors, includes primary shades of blue, green, red, and yellow - in 0.3 fl oz. squeeze bottles. Perfect for adding color to cake batter, icings, or eggs! 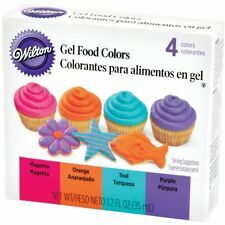 Gel food coloring from Wilton is concentrated - very little needs to be used. To tint add in small amounts until desired shade is achieved, color will darken over hours. ✵ Made in a facility that also produces tree nuts, eggs, shellfish, milk, soy, and wheat products. Freshest if used within 24 months of opening. ✵ Made in the United States. 32g dropper bottle allows for mess free control of colour, High concentration pigment,Fast drying and easy to clean Apply with a brush or a dab on with sponge to cover large areas, Suitable for icing, brushing and chocolate, Contains alcohol. 100% edible metallic paint.Add a touch of sparkle or a blanket of glamour to any cake with our metallic paints Great for gumpaste, marzipan, icings, buttercream, chocolate, macaroons, rainbow cakes and much more. For cake baking and decoration . Concentrated and radiant paste colour for sugarcrafters and cake decorators.Use it on Icing, Fondant, Marzipan, Gumpaste and more Will work fantastic on Rainbow Cakes, Macaroons, cookie batters and more. Versatile in use and would be great for numerous purposes The neon range is very concentrated and will present very vivid results, just a few drops needed Suitable for baking up to 200-220ºC . 7ml fine dusting powder, High concentration pigment, Dust or paint sugar work ,Mix into colour sugar paste and gum paste Suitable for brushing and chocolate, Soluble in alcohol or rejuvenator spirit to create paint, Alcohol free & 100% edible Add a special touch of luxury and sparkle with the lustre dust range. Dust using a dry brush to add accents of colour to sugar flowers and models. Great for gumpaste, marzipan, icings, buttercream, chocolate, macaroons, rainbow cakes and much more. .
7ml fine dusting powder, High concentration pigment, Dust or paint sugar work. 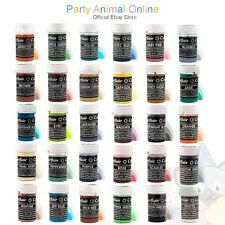 Mix into colour sugar paste and gum paste 100% edible, Suitable for icing, brushing and chocolate, Soluble in alcohol or rejuvenator spirit to create paint & Alcohol free Dust using a dry brush to add accents of colour to sugar flowers and models. Use to colour royal icing or add clear alcohol or rejuvenator spirit to create a vivid paint. Great for gumpaste, marzipan, icings, buttercream, chocolate, macaroons, rainbow cakes and much more. .
Magic Airbrush ColoursTM for cake decorations Work great with royal icing or any frosting, they are concentrated enough therefore only needing a few drops to reach colourful results Use various brushes to achieve different results-By covering a cake with a thin colour layer to painting creatively with no airbrush Designed for Airbrushing, Magic Airbrush ColoursTM have great smooth consistency with no particles hovering around Glycerin free . 32g dropper bottle allows for mess free control of colour, High concentration pigment, Oil based - no need to heat Just temper with white chocolate, No more lumpy or speckled chocolate, 8 colours to choose from & Alcohol free This range of 7 vibrant colours has been designed specifically for use with chocolate. It allows you to successfully colour chocolate without affecting texture. Great for gumpaste, marzipan, icings, buttercream, chocolate, macaroons, rainbow cakes and much more. .
0.4 Grams of concentrate /powder/ paint. start by adding a small amount of the already mixed paint to the filling. take a small amount of the paint on the tip of a knife and then mix it with a half teaspoon of water. Sugarflair Food Colouring Powder Blossom, Lustre or Craft Tints - ANY 6! Sugarflair Food Colour Dust. Choose any 6 from 42 edible 'Blossom' colours. You may also mix-and-match with our 28 edible 'Lustre' dusts or our 10 non-toxic 'Craft' dusts. BLOSSOM TINTS (EDIBLE). CRAFT DUSTING TINTS (NON EDIBLE). Metallic Gold Metallic sugar paste colour for cake decoration. It can be used with icing & brushing Edible Metallic Paints are suitable for painting sugar decorations, chocolate, marzipan, etc. Use various brushes to get different results from covering a cake with a thin colour layer to paint creatively with your imagination . 10ml no waste dropper bottle. 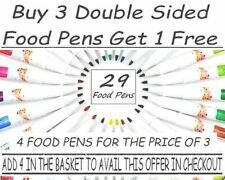 Ideal for colouring and brush painting cakes, flowers, biscuits, etc. Water, Potassium Sorbate, E122, E133, Citric Acid. Royal Blue Liquid Food Colour. This is the design of the bottle, the seal has not been broken. 32g gel dropper bottle allows for mess free control of colour, High concentration pigment Suitable for temperatures up to 180°C Create a spectrum of shades from each colour, Suitable for icing, brushing and baking, 24 colours to choose from & Alcohol free Simply knead a small amount into sugarpaste, or swirl into buttercream or frosting. Can be used to colour cake batter. As little as one drop is enough to create a big impact. Our unique soft gel will not affect the texture of your sugarpaste Great for gumpaste, marzipan, icings, buttercream, chocolate, macaroons, rainbow cakes and much more. . Chef Master Gel Base Color 1 oz. per Container - total 3 Colors.